January | 2016 | Mike Lamberti, From Margate To Cleveland, And Back ! Long before the bright lights of the NFL, the glamour of All-Pro status and the chance to play in a Super Bowl were ever a part of Greg Olsen’s life, there was that moment that exemplified being a champion. And for Olsen, it came in the first round of the NJSIAA playoffs, in 2002. Olsen was a senior tight end for the Patriots, as well as a stalwart defender. He was destined to play college football on the D-1 level, but at that moment, winning a playoff game was paramount for him, and his dad, Chris, the team’s head coach, against upstart Passaic Valley High, of Little Falls. Entering that game, Hills was the top seed in the section while Passaic Valley had gained the final seed, at number eight. Pat Cosgrove, an assistant coach on Olsen’s staffs at St. Cecelia, Bergenfield, Paterson Eastside and Wayne Hills, as well as being an assistant today at Hills for current head coach Wayne Demikoff, recalls that first round game against Passaic Valley. Hills had established a winning tradition in 2002, but were also becoming known as the Buffalo Bills of its generation, having played for a state championship numerous times, but coming up short. And now, it looked like PV would pull the upset in the first round, eliminating the Patriots once again. The game had gone into overtime, with the teams tied at 21. Passaic Valley scored first, on a field goal, for a 24-21 lead. The Patriots had the ball next, and the way Cosgrove tells it, kicking a field goal was a possibility. When the coach left the huddle, the word among the players was that Greg Olsen told Monaghan to get him the ball and he’d do the rest. 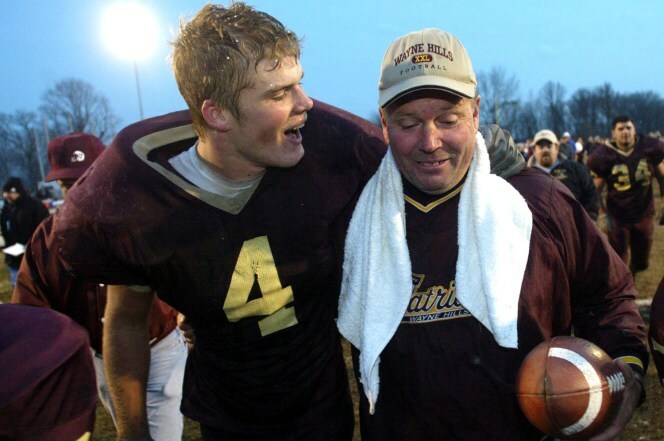 Greg Olsen and his dad, Chris, celebrate Wayne Hills’ first state title, in 2002. Hills would win the game, 27-24, and the momentum of the victory would carry over for the Patriots, who went on to win its next two playoff games, including a 19-0 victory over rival Ramapo in the championship game for the program’s first-ever title, after a win over a good Sparta team in the semifinals. Johnson, Passaic Valley’s head coach from 1999-2003 and again from 2012-2014, remembers the game well, too. Cosgrove credited Johnson and his team with a good game plan. One catch truly defined the Hills program. Instead, Hills would go on to win seven more state championships, from 2004-2008, and then again in 2010 and 2011. There would also be the famous 55-game winning streak, from ’04-09. Greg Olsen, of course, would play college football at the University of Miami and then, in 2007, was a first-round draft pick of the NFL’s Chicago Bears. After four years in the Windy City, which included an appearance in the 2010 NFC championship game, Olsen would be traded to the Carolina Panthers, where his career has flourished. In 2014 and 2015, he was named All-Pro, at tight end, and now, he’s preparing to play in Super Bowl 50. On a somber note, Jan. 28, 2016 is the two-year anniversary of the passing of Jon Goldstein, a long-time coach for Hills football, basketball and golf. It was late in the evening, on Jan. 28, 2014, when my cell phone rang. My editor, Nick Gantaifis, was calling, and since it was a Tuesday night, I figured he might be checking about a deadline question on an article I had written for the Wayne Today. “Hey, Nick,” I said, like I always do when he calls. “Did you hear about Goldy?” Nick said, forgetting to even say hello. “No,” I asked, figuring my pal Jon Goldstein, was up to something crazy at Wayne Hills. And then the next two words resonated in a way that left my entire body numb. Goldy had just finished coaching a JV basketball game for the Wayne Hills Patriots high school team when he began to feel ill. The game was at Fair Lawn High School and within seconds, the Fair Lawn trainers were at Goldy’s side, administering aid. Minutes later, an ambulance had arrived. At just 41 years of age, almost everyone who remembers that day figured Goldy would be just fine, that maybe this was just a health scare. But hours later, he was gone. Within five minutes of Nick’s call two years ago today, my phone rang again. 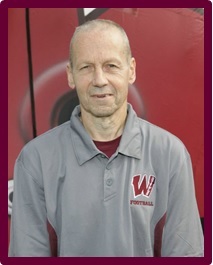 It was Chris Olsen, Wayne Hills’ long-time head football coach and Goldy’s best friend. Chris had retired to North Carolina, a few months earlier, but in this world of instant communication, it didn’t take long for the word to get around. A few days later, hundreds of friends and family would gather at Temple Beth Tikvah to say good bye. Olsen and his entire family would be on hand, and Chris gave the perfect account of how Goldy had arrived on the scene at Wayne Hills some 21 years earlier. “I invited him to come to a game,” Olsen said to the large crowd on Jan. 31, 2014. “So it’s game day and I’m getting ready. I turn around, and Jon is standing next to me. He says ‘I’m here’. I said, good, now get back a little, please. (As the crowd began to laugh out loud). Goldy (center) and members of the Hills football coaching staff. 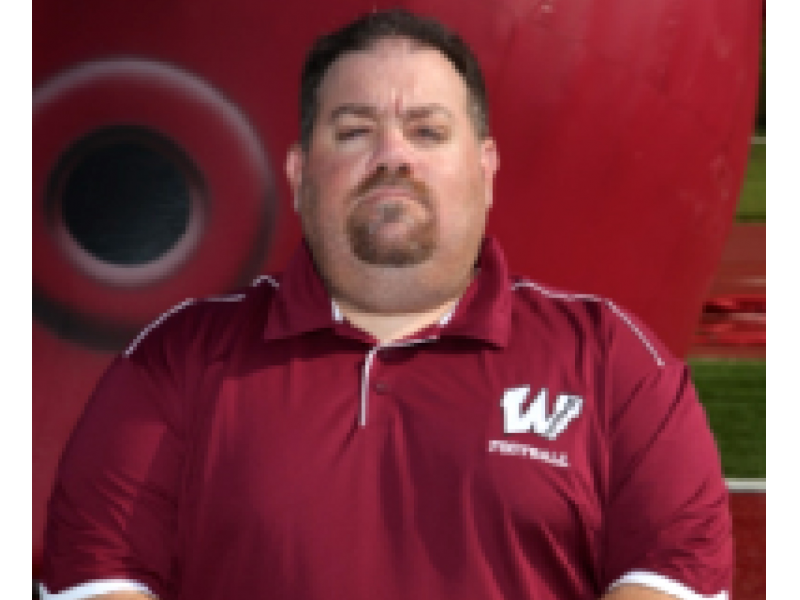 Fast forward to today, and in speaking with Wayne Hills’ current football coach, Wayne Demikoff, who was a long-time assistant at Hills and was a close pal of Goldy, he made the perfect analogy. “How much would Goldy have loved seeing Greg (Olsen) playing in the Super Bowl?” said Demikoff, as the Carolina Panthers prepare for Super Bowl 50 on Feb. 7, with Greg, the middle son of Chris and Sue, being an integral part of the Panthers’ success this season. Great question, I thought. And leave it to Demikoff to think of that right away. And while we’re at it, how much would Goldy love to see the success of this year’s Wayne Hills boys’ basketball team? The Patriots are 11-1, and the top seed in the upcoming Passaic County Tournament, under head coach Kevin Grimes, who was also very close to Goldy. Somewhere, in a place where Goldy is holding center court, talking baseball statistics, fantasy football and hearts he broke from female admirers, Jon Goldstein will be getting ready to watch Super Bowl 50. He’d known Greg Olsen since the now 30-year-old NFL All-Pro was a little kid, and will be smiling that mischievous grin as No. 88 lines up at tight end. 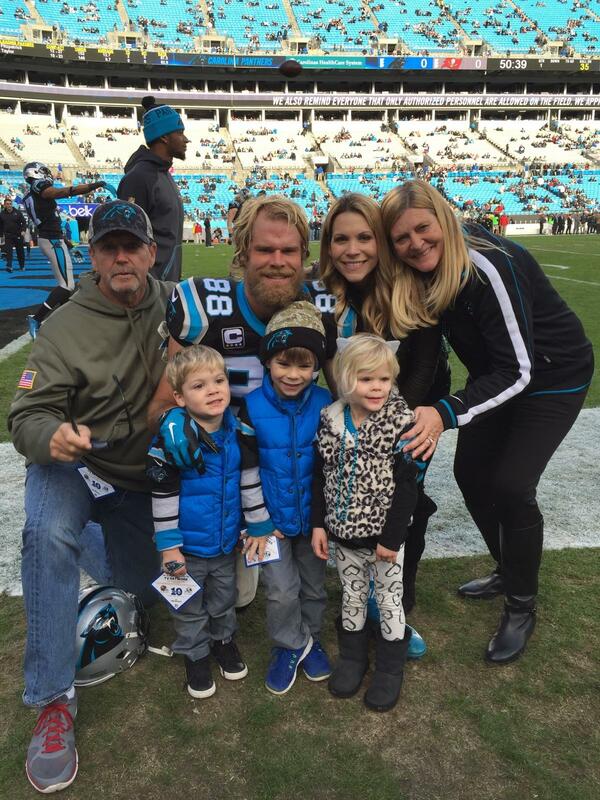 Carolina Panthers tight end Greg Olsen, here with (left to right), dad Chris, son TJ, son Tate, daughter Talbot, wife Kara and mom, Sue, was a dear friend of the late Jon Goldstein. At 44 years old, Michael DiPiano, Sr. had indeed entered the cross roads. With his health deteriorating because of diabetes, the Nutley native was on dialysis for kidney failure and had been read his Last Rites. 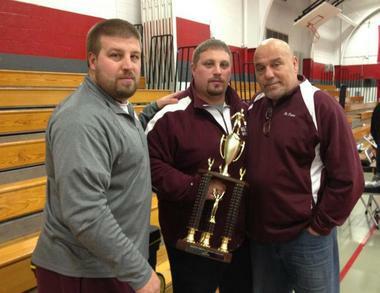 He was a devoted husband and father of three, a well known wrestling coach and athletic director in New Jersey. But now, his life was seemingly coming to an end. That was 21 years ago. Today, DiPiano (Big D to his friends) is beginning the 65th year of his life. What changed the course for this man? The gift was an organ transplant. In DiPiano’s case, it meant a new lease on life, after receiving a kidney and pancreas on Oct. 25, 1998. The organs were donated by a man we’ll know simply as Sean, a 21-year-old who, on Oct. 24, 1998, was killed in an automobile accident. Sean had indicated on his driver’s license that he wanted to be an organ donor in the event of his death. 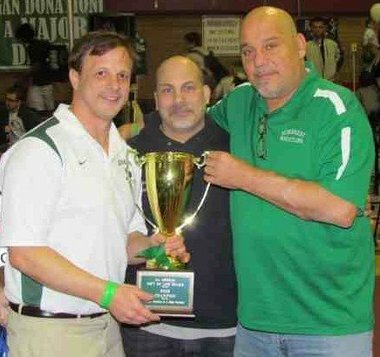 Mike DiPiano Sr. (right) with Delbarton wrestling coach Bryan Stoll (left) and state champion Guy Russo of West Essex at the Gift of Life Duals in 2012. 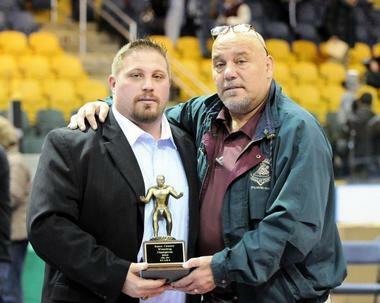 DiPiano’s new lease on life will be recounted at the sixth annual Gift of Life Wrestling Duals, set for this Saturday, Jan. 16, at Nutley High School. 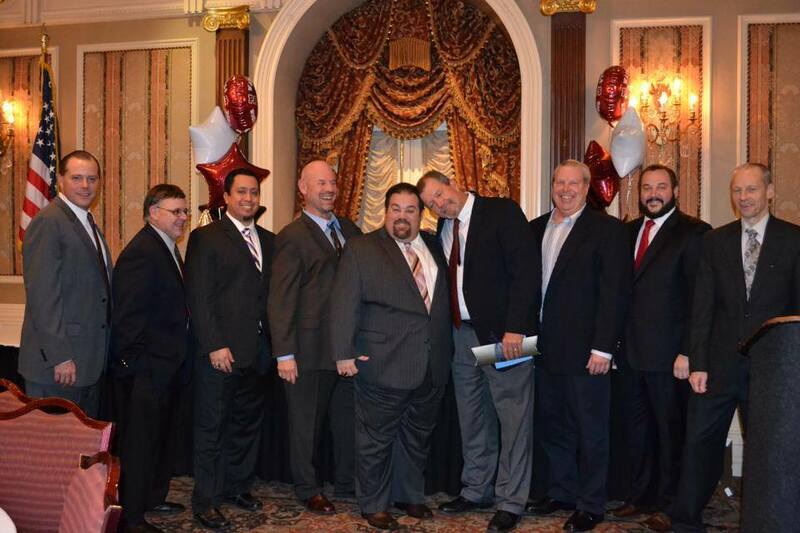 With a wrestling theme of ‘Organ Donation is a Major Decision’ as the backdrop, there will be six teams competing, including the host school, Nutley, which is now coached by DiPiano’s eldest son, Mike. The other teams participating are Demarest, Union City, St. Benedict’s, Robbinsville and Garfield. Mike DiPiano and youngest son, Frank, after Nutley won the 2012 Essex County Tournament championship for the first time in school history. Frank recently stepped down as Nutley’s head coach, after a marvelous run, and is now an administrator at his high school alma mater, St. Benedict’s, in Newark. Wrestling begins at 9:30 a.m., and continues with matches at 11 a.m. and 12:30 p.m. After a break, DiPiano will speak to the crowd, telling his story and the importance of organ donation, at 2:30 p.m. Following that, wrestling resumes with third and fifth place matches, followed by the championship match, commencing at about 4:30 p.m. The success of the duals, since 2011, speaks for itself, mainly through awareness. The elder DiPiano’s association with St. Benedict’s Preparatory School in Newark is legendary. As the wrestling coach there, he amassed a record of 274-89, and was named the state’s Coach of the Year by the Star-Ledger in 1987. He is a member of the St. Benedict’s Hall of Fame, as well as the USA Wrestling Hall of Fame in Stillwater, Oklahoma. After coaching at St. Benedict’s, DiPiano became the school’s athletic director. Now retired as the A.D., he remains associated with the school. In May of 2011, DiPiano received the school’s highest honor to a Lay person, the Medal of St. Benedict’s. Mike DiPiano Sr. along with sons, Michael (left) and Frank. DiPiano’s family, wife Karen, daughter Michelle and his sons had never given up on the rock of the family beating any kind of odds. 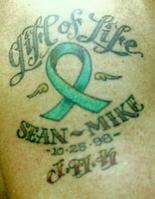 The tattoo on DiPiano’s arm, honoring Sean. On the surface, DiPiano is a hard-nosed individual, a man’s-man who takes no prisoners, so to speak. But he has no problems expressing his emotions on this subject. He recalls attending the first Transplant Games, for those athletes who are recipients of organ donation, in Minnesota eight years ago. DiPiano’s message has resonated well in New Jersey, where the theme of Saturday’s tournament will focus on the need for people to be organ donors. Michael Sr. has been to numerous Transplant Games since 1998, both in the United States and abroad, including Thailand and Australia. DiPiano has competed in athletic events at the games. He speaks constantly on the need to be an organ donor. He is very much involved with the work of the National Kidney Foundation, as well as the New Jersey Sharing Network, which procures tissues and organs. Mike DiPiano is indeed an amazing man. He thanks his family, his friends and loved ones for the constant support. And he remembers a young man named Sean.“I’ll never be able to thank him enough,” DiPiano said. Mike DiPiano, Sr., hosts a Christmas party every year at St. Barnabas Medical Center in Livingston for children who have had, or will be receiving, an organ transplant. He’s here with his reliable ‘Elves’.